zarinahtakesapaycut: Is the PCAOB a toothless tiger? PwC Malaysia fraud and suppression of evidence goes unpunished. Is the PCAOB a toothless tiger? PwC Malaysia fraud and suppression of evidence goes unpunished. PwC Malaysia forced to Reveal 162 Documents that they were hiding. 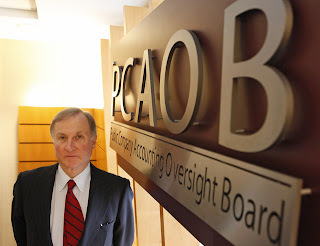 While Mr James Doty can lament about the inability of the PCAOB to inspect auditors in China, he should be more worried about the "gaping hole in their oversight" that allowed the PCAOB to register PwC Malaysia, even though they were aware of the fraud committed by PwC Malaysia back in 2003. "PricewaterhouseCoopers LLP and its Office of General Counsel were made aware of the fraud allegations against PwC Malaysia back in 2003, and that they did nothing about it. PricewaterhouseCoopers Malaysia, together with all the other offices of PwC worldwide were supposed to allow IBM Corp to acquire their Consulting Business, as part of a global acquisition by IBM Corp of the Consulting and Technology arm of PwC. According to the letter sent to the SEC in The United States as well the Article of Non Opposition issued by the EEC in Europe, there was no way for the Consulting arm of PricewaterhouseCoopers in Malaysia to remain exempt from the sale. And the consulting arm of PwC Malaysia was and still is PricewaterhouseCoopers Consulting Sdn Bhd (464379-U), which till today remains under the ownership and control of the MD of PwC Malaysia, Chin Kwai Fatt; the Executive Chairman, Johan Raslan and other Senior Partners of PwC Malaysia. But what happened in Malaysia is an interesting sleight of hand, where a company called PricewaterhouseCoopers Consulting (East Asia) Sdn Bhd, was renamed as PwC Consulting Malaysia Sdn Bhd (289801-A) on 20-11-2001, to be sold off to IBM Corp as the 'legitimate' Consulting arm of PwC in Malaysia." The PCAOB can obtain even further evidence of the fraud and suppression of evidence. All they need to do is to call Johan Raslan, Chin Kwai Fatt and Khoo Chuan Keat and ask the three to give copies of their affidavits opposing the application for discovery of documents by the plaintiffs in June and July of 2011, in the Kuala Lumpur High Court. These three, Malaysia's very own version of the '3 Idiots', are directors of PricewaterhouseCoopers Consulting Sdn Bhd, and the PCAOB can read for itself how their affidavits signed in mid-2011 show clear evidence of suppression of evidence, concealment and non-disclosure, of relevant emails, working papers, business plans, valuation reports, letters and other documents. They have been trapped by the affidavit by a Miss Ho, whose affidavit signed in January 20, 2012, clearly lists all 162 documents that they have been concealing all these years. The PCAOB can also call Sreedharan Nair and Eric Ooi, the Senior Partners of PwC Malaysia who are contesting to be the next MD of the firm in the elections soon, and get the truth from them. Their suppression of evidence is a clear violation of the IBM takeover and the SEC rules back in 2002. So what happens to the entire transaction now? What sort of checks and balances does the PCAOB have, when they are able to register a firm like PwC Malaysia, which not only commits fraud, but keeps it going for years and years. What is the difference between PwC and Arthur Andersen? One shreds documents and the other conceals them. What is the PCAOB going to do about PwC Malaysia? Or are they going to continue ignoring the fraud?